Allow me to submit for this year's conversion competition "The Parade of Banners" at the Chateau de Pierredragon, also known in English as "Stonedragon Castle" in the fair land of Bastonne. Essentially. it simply involves the conversion of mounted knights into standard bearers on foot, here arrayed on the windswept drawbridge of Stonedragon Castle. In the first picture stand the bearer of the Battle Standard, Jean Dragoncoeur of Bastonne (yours truly), and the bearer of the Banner of the Grail Knights. In the second picture can be seen behind us the visage passant of the white dragon Fierygant above the great entrance arch of the castle. In the third picture are all the noble bearers of the various Bretonni standards and flags presented at this year's Parade of Banners at Stonedragon Castle. It is hoped that this entry meets with your approval and satisfaction. Allow me to submit my entry to this year's conversion competition. The thought that inspired this piece was, "Why does the Chaos army have Archaon on an impressive steed but the King of Bretonnia is not on one?" While I do not have photographs whilst in progress, I hope the comparison with the original piece will instead be a good "before-and-after" presentation. Trust this work merits your approval. 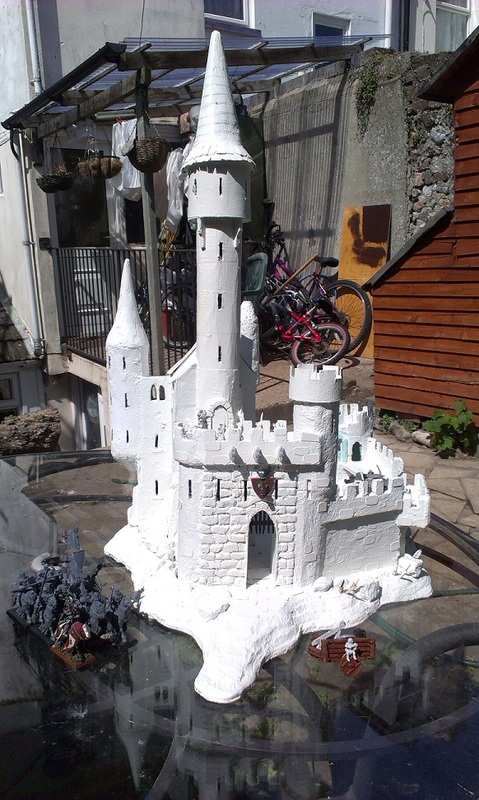 The Idea to put the castle on here was first and foremost, I admit to show it off. But in hindsight I thought to myself "Who better to show it to then you? To ask...What I should add? What colours should I use? and what should a true Bretonnian Castle look like? So please feel free to comment, and post your criticism, (be polite)...and now without any further ado. The Castle has been, and still is a work of pure evolution. You’ll see photos all along the way through the design, and see how it’s changed and progressed with time. The way I work, as with most sculptures, is with an idea, which constantly changes and grows as I work on it. I get a kick out of designing something which no other Warhammer player has yet dreamed or dared of making. Movies, and past castles that I’ve visited, with a very large amount of imagination, have all lent their hands in this project. The idea: To build a distinctive Bretonnian Castle, one I can use in a game(where appropriate) or just as a mere display piece, so show off to every Bretonnian player out there. I think a Castle is as much as personal and important as your army you represent. And I would encourage any DIY enthusiast to pick up that craft knife and get hacking! I am looking for a name for this castle, Bear in mind its ancient High Elven heritage. Possible names I’ve considered are Castle Carcassonne, Lou Touradou, Sibourne,and Castle Desfleuve. Any other ideas please let me know, and enjoy the article! This article is for Tulmir, and of course, the Lords and Ladies of the Round Table. Enjoy! A major challenge every Bretonnian player faces is the careful storage of his or her hard-worked on Knights. Some of us use foam trays specially made for our miniatures, some of us used modified toolboxes, some use just boxes of an appropiate size for an Army. However, our lances, banners, swords and scabbards, tassels, and even the crests of a helmet can bend and break, ruining hours of hard work. The best way to prevent such disasters, is of course, careful storage, and the best way to store and transport our knights? By keeping rider and mount stored separately, of course! Article about an alternative trebuchet model and how to assemble it. The current official trebuchet model looks great but it does have quite a bit of flaws – it is difficult to assemble and paint, costs quite a bit of money, but most important flaw for me is that it is made of metal and is very hard to customize. How to build Bretonniansâ€¦on a budget!